This past week I attended one of the largest hospital marketing conferences in the country, the Society for Healthcare Strategy and Market Development (SHSMD) Annual Conference, held in Phoenix, AZ. These events always offer many networking and learning opportunities, and SHSMD was no exception. Through the individual sessions and presentations some new online marketing trends became apparent. It was clear at the show that many hospitals are revamping their websites with a focus on engaging consumers through wellness efforts and social media. Hospital marketers are increasingly aware of the vast array of tools available to them in their effort to market their hospitals as community leaders. Chris Boyer from Inova Health System and Chris Bevolo from Interval did an excellent job discussing how Inova Health Systems is getting their brand out there by “Building Your Brand With Wellness”. 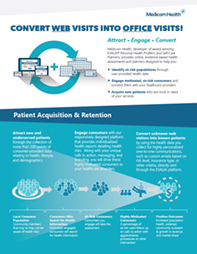 It is a great program that keeps patients engaged and coming back to the Inova website. Chris Bevolo also mentioned his newly published book titled Joe Public Doesn’t Care About Your Hospital, which explains why you need to look outside traditional advertising. Another great presentation was given by Alan Shoebridge from Providence Health & Services (Oregon). His talk was reminiscent of many other conversations I had during the conference about keeping the consumer engaged. Shoebridge’s discussion centered on the ineffective nature of traditional focus groups, and the benefit of online research, which is much more cost-effective and convenient. Lastly, it was clear at the conference that social media is continuing to gain steam. Many marketers are still reluctant to believe it is needed, and some just simply do not have the time to do it. Sadly, those companies are missing out on building valuable connections, not just with patients, but also with other healthcare leaders that may offer a new point of view. These connections can be key to becoming an innovative front runner in today’s healthcare industry. I want to thank everyone who stopped by our EVALIA™ Personal Health Profilers booth. Over 75 visitors stopped by to find out more about our newest product line, and it was great to hear so much positive feedback. Congratulations toHolly Kiffmeyer from Centracare Health System, the winner of a 3G Kindle in our drawing!